Between the end of 1945 and July 1946, Hungary went through the worst inflation ever recorded. In 1944, the highest denomination was 1,000 pengő. By the end of 1945, it was 10,000,000 pengő. The highest denomination in mid-1946 was 100,000,000,000,000,000,000 (1020) pengő. A special currency, the adópengő – or tax pengő – was created for tax and postal payments. The value of the adópengő was adjusted each day, by radio announcement. On 1 January 1946 one adópengő equaled one pengő. By late July, one adópengő equaled 2,000,000,000,000,000,000,000 or 2×1021 (2 sextillion) pengő. When the pengő was replaced in August 1946 by the forint, the total value of all Hungarian banknotes in circulation amounted to 1/1,000 of one US dollar. This is the most severe known incident of inflation recorded, peaking at 1.3 × 1016 percent per month (prices double every 15 hours). The overall impact of hyperinflation: On 18 August 1946, 400,000,000,000,000,000,000,000,000,000 or 4×1029 (four hundred quadrilliard on the long scale used in Hungary; four hundred octillion on short scale) pengő became 1 forint. For periods after July 2008, no official inflation statistics were released. Prof. Steve H. Hanke overcame the problem by estimating inflation rates after July 2008 and publishing the Hanke Hyperinflation Index for Zimbabwe. Prof. Hanke's HHIZ measure indicated that the inflation peaked at an annual rate of 89.7 sextillion percent (89,700,000,000,000,000,000,000%) in mid-November 2008. The peak monthly rate was 79.6 billion percent, which is equivalent to a 98% daily rate, or around 7× 10108 percent yearly rate. At that rate, prices were doubling every 24.7 hours. Note that many of these figures should be considered mostly theoretical since hyperinflation did not proceed at this rate over a whole year. Chinese people in Zimbabwe are a small community that grew in size in the 2000s as an influx of Chinese shopkeepers settled in the country.Initially the arrival of shopkeepers from China aroused hostile local attitudes with products sold by Chinese merchants derisively called zhing-zhong. However, during the worst of the Zimbabwe economic crisis, Chinese shopkeepers were able to import basic goods despite the disruptive effect of hyperinflation, bringing some relief to Zimbabwean consumers. The ability of Chinese stores to continue business won them the appreciation of local consumers.Under official cultural and educational cooperation agreements, there are as of 2009 three teachers and nine medical personnel from China in the country. Constant purchasing power accounting (CPPA) is an accounting model approved by the International Accounting Standards Board (IASB) as an alternative to traditional historical cost accounting under hyper-inflationary environments. Under this system, financial capital maintenance is measured in units of constant purchasing power (CPP) in terms of a CPI (consumer price index) during low inflation. During high inflation and hyperinflation it can also be measured in a monetized daily indexed unit of account (e.g. the Unidad de Fomento in Chile) and in terms of a daily relatively stable foreign currency parallel rate or daily index. The Dawes Plan (as proposed by the Dawes Committee, chaired by Charles G. Dawes) was a plan in 1924 to resolve the World War I reparations that Germany had to pay, that had strained diplomacy following World War I and the Treaty of Versailles. The occupation of the Ruhr industrial area by France and Belgium contributed to the hyperinflation crisis in Germany, partially because of its disabling effect on the German economy. The plan provided for an end to the Allied occupation, and a staggered payment plan for Germany's payment of war reparations. Because the Plan resolved a serious international crisis, Dawes shared the Nobel Peace Prize in 1925 for his work. It was an interim measure and proved unworkable. The Young Plan was adopted in 1929 to replace it. In philately, the denomination is the "inscribed value of a stamp". For instance, if you visit the post office to buy a stamp to pay $1's worth of postage you will receive a stamp that has the value "$1" printed on it in words or numbers. The denomination is not the same as the value of a stamp on the philatelic market, which is usually different, and the denominations of a country's stamps and money do not necessarily match. For instance, there might be a 47c stamp to pay a particular postal rate but there is unlikely to be a 47c coin. Economic collapse is any of a broad range of bad economic conditions, ranging from a severe, prolonged depression with high bankruptcy rates and high unemployment (such as the Great Depression of the 1930s), to a breakdown in normal commerce caused by hyperinflation (such as in Weimar Germany in the 1920s), or even an economically caused sharp rise in the death rate and perhaps even a decline in population (such as in countries of the former USSR in the 1990s).Often economic collapse is accompanied by social chaos, civil unrest and a breakdown of law and order. The name Papiermark (pronunciation ; English: "paper mark", officially just Mark, sign: ℳ) is applied to the German currency from 4 August 1914 when the link between the Goldmark and gold was abandoned, due to the outbreak of World War I. In particular, the name is used for the banknotes issued during the hyperinflation in Germany of 1922 and especially 1923. Hyperinflation in Zimbabwe was a period of currency instability in Zimbabwe that began in the late 1990s shortly after the confiscation of private farms from landowners towards the end of Zimbabwean involvement in the Second Congo War. During the height of inflation from 2008 to 2009, it was difficult to measure Zimbabwe's hyperinflation because the government of Zimbabwe stopped filing official inflation statistics. However, Zimbabwe's peak month of inflation is estimated at 179.6 billion percent in mid-November 2008.In 2009, Zimbabwe stopped printing its currency, with currencies from other countries being used. In mid-2015, Zimbabwe announced plans to have completely switched to the United States dollar by the end of 2015. Hyperinflation therapy (HIT) is a very common therapy performed on patients who are suffering from some sort of respiratory distress. The therapy involves applying volumes greater than normal to reinflate the collapsed alveoli in the lungs. There are many different techniques used to administer hyperinflation therapy. The respiratory therapist typically decides which method is best for each patient. Inflation accounting comprises a range of accounting models designed to correct problems arising from historical cost accounting in the presence of high inflation and hyperinflation. For example, in countries experiencing hyperinflation the International Accounting Standards Board requires corporations to implement financial capital maintenance in units of constant purchasing power in terms of the monthly published Consumer Price Index. This does not result in capital maintenance in units of constant purchasing power since that can only be achieved in terms of a daily index. The Old Taiwan dollar was in use from 1946 to 1949, beginning shortly after Taiwan's handover from Japan to the Republic of China. The currency was issued by the Bank of Taiwan. Hyperinflation prompted the introduction of the New Taiwan dollar in June 1949, shortly before the Nationalist evacuation from mainland China in December. The general price level is a hypothetical daily measure of overall prices for some set of goods and services (the consumer basket), in an economy or monetary union during a given interval (generally one day), normalized relative to some base set. Typically, the general price level is approximated with a daily price index, normally the Daily CPI. The general price level can change more than once per day during hyperinflation. In economics, shock therapy is the sudden release of price and currency controls (economic liberalization), withdrawal of state subsidies, and immediate trade liberalization within a country, usually also including large-scale privatization of previously public-owned assets. The dinar (Cyrillic script: динар) was the currency of the three Yugoslav states: the Kingdom of Yugoslavia (formerly the Kingdom of Serbs, Croats and Slovenes), the Socialist Federal Republic of Yugoslavia, and the Federal Republic of Yugoslavia between 1918 and 2006. The dinar was subdivided into 100 para (Cyrillic script: пара). In the early 1990s, there was severe and prolonged hyperinflation due to a combination of economic mismanagement and criminality. Massive amounts of money were printed; coins became redundant; inflation rates reached the equivalent of 8.51×1029% per year. The highest denomination banknote was 500 billion dinars; it was worthless a fortnight after it was printed. 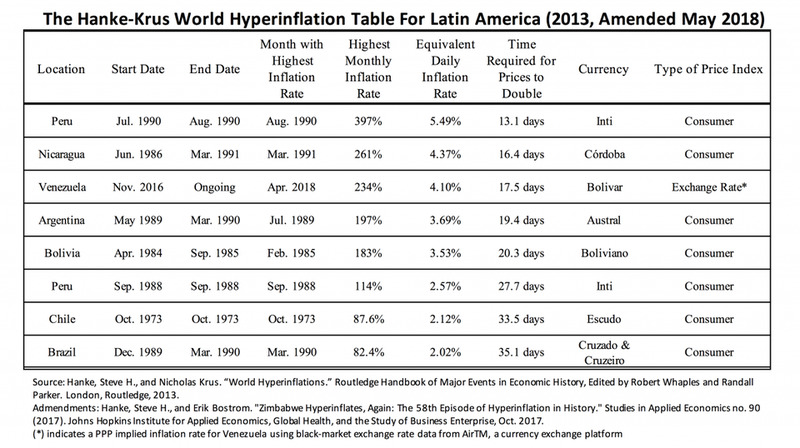 This hyperinflation caused five revaluations between 1990 and 1994; in total there were eight distinct dinari. Six of the eight have been given distinguishing names and separate ISO 4217 codes. Zero stroke or cipher stroke was an alleged mental disorder, reportedly diagnosed by physicians in Germany during the hyperinflation in the Weimar Republic (1921–24). The disorder was primarily characterized by the desire of patients to write endless rows of zeros, which are also referred to as ciphers.